I mentioned earlier this week that we got Harry an exersaucer. Ant let me pick out something for our six year anniversary, and I decided Harry needed a gift more than I did :). We were torn between getting a jumperoo or an excersaucer and finally settled on the Bright Starts Bounce-a-Bout Activity Center. It's an excersaucer with a bounce pad on the bottom, so it's kind of like a hybrid. Although Harry isn't quite tall enough to bounce on it yet. The activity center has tons of different toys for Harry to play with. One of the things I liked most about this particular activity center is the four little hooks that can be used to attach other toys. I really like this feature because I can continually switch out toys so that Harry doesn't get bored with the excersaucer. The seat has three different positions for babies as they grow, but right now it's too big for Harry to fit in comfortably without any support. We've been tucking a couple of hand towels around him and that seems to do the trick. 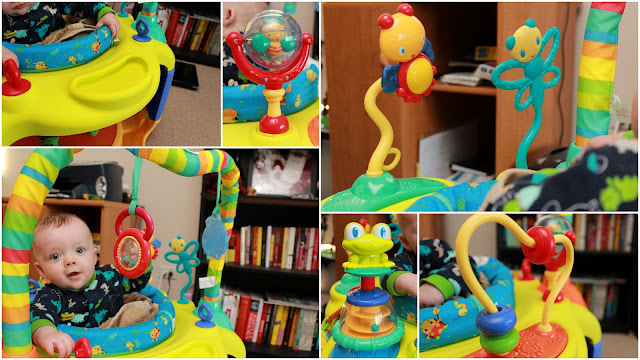 If you're in the market for an excersaucer, I'd highly recommend the Bright Starts Bounce-a-Bout! Harry has enjoyed it so far and with the ability to attach different toys to it he'll be able to enjoy it for a long time. It was also really easy to put together, I did it myself and it took me a little over a half hour to get it set up. And look what little man discovered yesterday while we were playing. 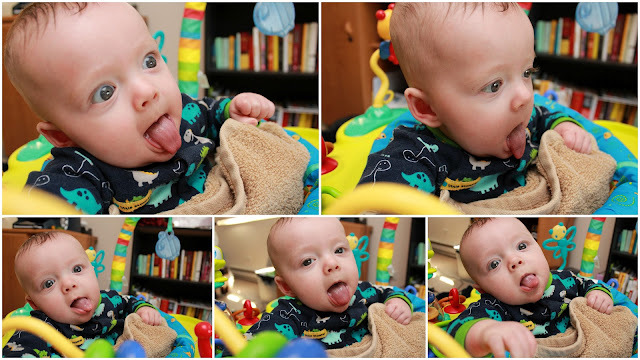 He was sticking his tongue out all day yesterday. So funny! Not sure if that's a developmental milestone like discovering his hands or just him being a goof, but it was so cute either way.